Blabla404, VIP CodinGamer often trusting the challenges' Top 10 and also winner of CodinGame January 2013, has written excellent C++ corrections (in French) where he presents his vision and approach of the exercises of previous CodinGame issues in a very complete, precise, and educational way. We love his initiative and we're sure it will be pretty useful to C++ CodinGamers. 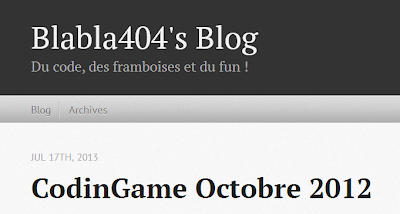 For the moment, 3 corrections are proposed: CodinGame October 2012, CodinGame Morocco 2012, et CodinGame January 2013.